1. 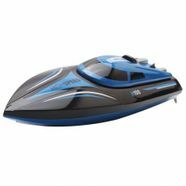 30km/h and low resistance in the water ensured by the powerful motor and V-shaped hull . 2. Automatically corrects the deviation with rudder swaying left and right continuously. 3. Retreat and self-righting designed for carefree sailing - no worry about barriers and capsizing. 4. Low voltage alarm + weak signal alarm remind you to make the boat return in time. 5. 2.4GHz 4CH LCD transmitter - you can know the real-time status and sail as far as possible. 6. Boat battery 7.4V 600mAh lithium-ion ( included ).